To make your first-time visit to Pattaya a memorable one, we have prepared this beginner's guide about Pattaya nightlife especially if you plan to visit the Walking Street or any of the other notable areas in the city during your stay. This guide will give you an idea of what you can expect on your first walk through the wild side of the city. The number of beaches in Pattaya is not as much as those you see in other parts of Thailand because it is an urban setting with rows of canopies and deck-chairs. Although the sea is dirty and unclean, yet people love swimming in it because they claimed to have cleaned up the water in the recent years and marked those areas that are suitable and safe for swimming. The Jomtien beach, which is a nearby is just 15 minutes' drive, is much more swimmer-friendly but there is sometimes about of untreated sewerage leaking into the beach often and often. There are one or more islands offshore whose beaches that are by far more beautiful. The beaches on these islands can be easily reached in one day. Take for example; the main beach in Koh Laan has rows of restaurants and other beautiful places. Notwithstanding, it is well worth hiring a mope and driving over to the other side to take a great glimpse from the top with some very serene beaches over there. You can as well take a stroll along the coast for a while n order to get away from the multitudes. Nightlife in Pattaya can be both renowned and infamous to the outside world. This makes it somewhat intimidating for a first-timer. Its sheer scale can be profoundly overwhelming with the Walking Street alone being around one kilometer long from one side to another with 80 go-go taverns, a dozen nightclubs, and unlimited beer inns. To make it easy for you as a first timer, here is a Pattaya nightlife beginner's guide for your first visit to the Walking Street. The Walking Street consists of dance and go-go bars, strip clubs and brothels on either side of the street with loud music playing in the background decorated with multi-colored dancing lights. Girls and lady-boys can be found at the front desk of the bars either having their makeups or adjusting their dress merely to catch the attention of the passers-by while some can be seen dancing to the tunes being played there. If you are the type that is looking for romance, the Pattaya's Butterflies are there for you! The butterflies first try to catch the bigheartedness of the Westerns then listen to their stories especially when they elaborate on their Butterfly Catches. Isn't that romantic? You can finally retire into the Bamboo Bar until its closing time after exploring the Walking Street and other places around. The bar actually on the left side of the Walking Street with a leading sign on the road. A lot of stories have been heard about the Bamboo Bar being the hideout for adult men cooling off with younger Thai girls. Despite having seen such scenarios in other places in Thailand but the Bamboo Bar gives me different feeling because it makes me feel young! There are enough seats to watch the live bands perform and get the old men on their dancing shoes. The bands play a mixture of western and Thai music which keeps the cheering crowd dancing all night long to the DJ's selections. The city of Pattaya is well renowned as an enormous transgender community popularly called the ladyboys across the globe. Apart from the family-friendly cabaret shows, there is an impressive amount of strictly-adult-themed beer bars and go-gos committed to women who are once (or, in most cases, are still) men. The types of v depend on the categories of ladyboys that can be found in them including everything from calm and relaxing bars which happen to have mostly ladyboy staff to strip clubs and go-gos. Pattaya proposes a variety of amusement, theme parks gardens, and theme and with other types of sports venues on the mainland. Also present are good numbers of quality golf courses, motorsports, horse riding, a car racing circuit, and karting. For lovers of light aircraft, there are some small airfields as well. Pattaya offers some of the best shopping outlets outside the city of Bangkok. The shopping outlets comprise of several newly constructed malls while some are still being built. You can also check out the older "MIKE'S & ROYAL GARDEN PLAZA" which can be accessed from the Beach Road or the Second Road. These two also have quality goods at competitive prices. The ROYAL GARDEN also has a café on the top floor that gives you of the bay while the MIKE'S has a rooftop public swimming pool! There is the Samurai Sword or replica gun?!?!... al souvenir stuff and some things that might cause a few raised eyebrows, lots of ersatz stuff and big trademark copies, CDs, and DVDs that you can get for as low as 150 baht, computer programs and many more. 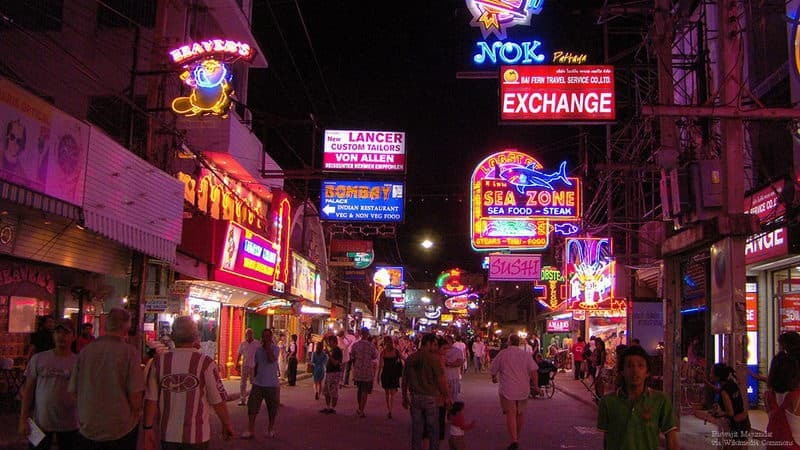 Be more cautious while enjoying Pattaya's night scene because they are not family-friendly with over 1,000 bars catering for adult tourists! Pattaya is more suitable for singles and couples rather than for families. Hearing a girl talking to you about "Thai Massage" is very popular waking down the street. Moreover, that message is much more than massage in Pattaya! But if you insist on going for the "Thai Massage," make sure the price is agreed upon because some of them can hike the price on your way while some may even increase the rate after you might have started the massage session. Others may even fake a police raid while the session is ongoing despite the fact that you do not involve in illegal activities because messages are perfectly fine in Thailand. Generally, it is a common thing for law enforcement agencies to leave clubs alone since it is not a proper thing for club business owners to police to enter into the clubhouse and shut down their businesses leaving it locked throughout their raid. Nevertheless, you have to keep that in mind. One of the main reasons why police are raiding clubs is drugs which are illegal in Pattaya. While that may be the case in most other countries, the penalties for not only using drugs but for having drugs on you may be punishable by up to death.